Pearson’s Project STEM for grades K–8 provides research-based materials that make it easy for teachers to integrate STEM< seamlessly into existing curricula and instruction. Through 18 topics and accompanying program guides, Project STEM works with any elementary or middle grades science program. Each module follows the same format: Introduce, Teach, and Evaluate. 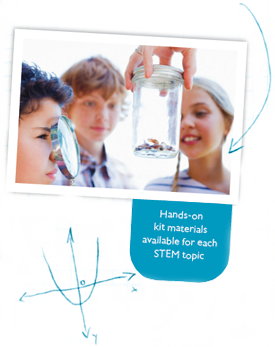 Topics cover Life, Earth, and Physical sciences and illustrate how the four STEM areas are connected through hands-on labs, projects, and background materials. The integrated curriculum infuses reading, writing, and math practice with scientific inquiry and the engineering design process. Teachers can actually save time in their instruction by supporting the Common Core curriculum in this project based approach. Through confi dence-building professional development and the project-based instructional approach, Pearson Project STEM empowers teachers to raise expectations and improve student performance. In an area where teachers often lack training and confidence, Project STEM guides and supports teachers in developing the tools and confidence they need to be successful. Students’ natural interests in science and engineering blossom through both real-world engineering design problems and hands-on inquiry. The activities and assessments promote higher-order, critical thinking skills that will result in improved student performance.